Strawberry Rhubarb Chia Pudding is a delicious Keto Recipe that can be enjoyed for breakfast, as a snack, or even for dessert! Low-Carb, Sugar-free, dairy free, and full of good for you fats! This recipe utilizes a homemade Strawberry Rhubarb Sauce that you can have already prepared in your fridge and ready to use to make this pudding. An easy to make, delicious recipe to have on hand for when those cravings hit! Recently, my family celebrated the marriage of my nephew Austin to his beautiful bride Hannah (welcome to the family!). While on that trip, I slipped. Yes. I fell from grace and cheated on my Keto diet. Let me tell you, the worse thing to do is to cheat on your diet that has been making you feel all kinds of awesome and then a week later regret it completely and totally. I started feeling all kinds of awful and even developed this gorgeous blemish on my chin. My body started to hurt and for the first time in months I woke up to aching in my left leg. Well, if anything is going to push a person to get back on the wagon, then that should be it. Since I had allowed myself carbs and sugars I was craving them again. Ugh. So not happy about this but I feel it is only fair to let you all know. I’m far from perfect. I do have a lot of self control but once that control is lost, watch out people! I had seen a recipe in Cooking Light while browsing my Kindle Fire magazines to kill my boredom of a 12 hour ride. This recipe was for fruit on the bottom pudding. I immediately thought that I needed to take that recipe, make it my own, and make it keto friendly. I have a ton of delicious rhubarb in my patch this year so I immediately thought of my Mom’s Rhubarb Sauce (pictured above) and how it would be awesome to incorporate into this recipe! 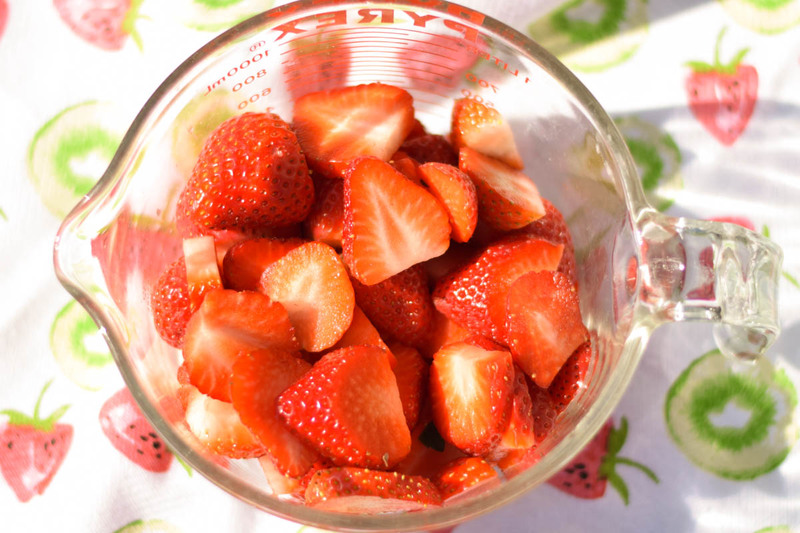 However, we have also been hooked on strawberries this year, more so because we’ve been enjoying them with my Low Carb Cheesecake Fruit Dip so much. I decided it was time to create a keto friendly rhubarb sauce, but this time I wanted to add strawberries to the picture. 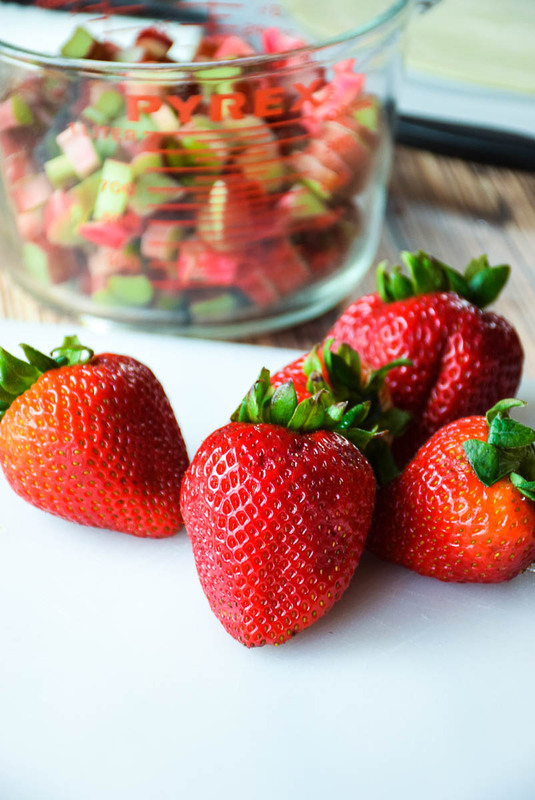 Pin the recipe for Strawberry Rhubarb Chia Pudding! 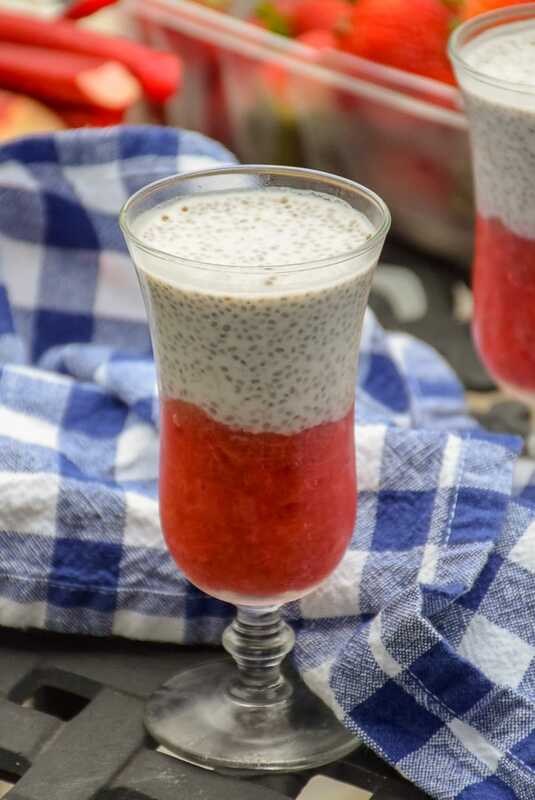 Strawberry Rhubarb Chia Pudding is a delicious Keto Recipe that can be enjoyed for breakfast, as a snack, or even for dessert! 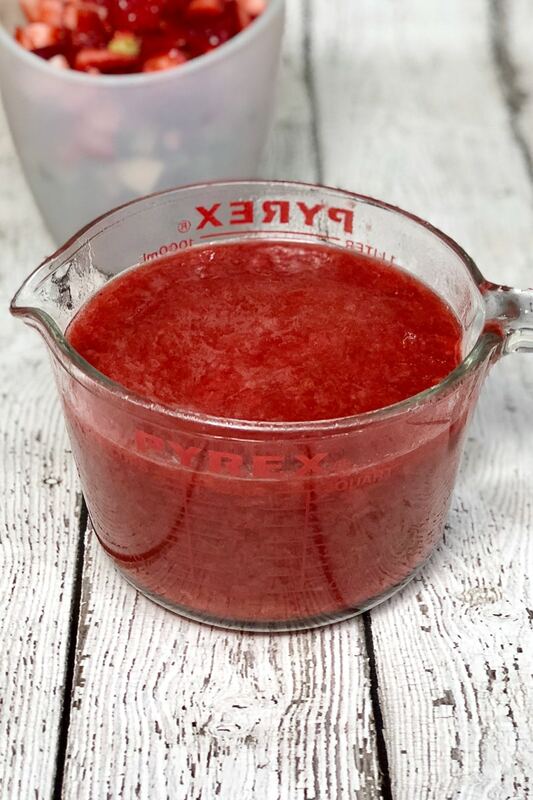 Low-Carb, Sugar free, dairy free, and full of good for you fats, this recipe utilizes a homemade Strawberry Rhubarb sauce that you can have already prepared in your fridge! Over medium low heat, place diced rhubarb, diced strawberries, and 1/2 cup of Truvia Baking Blend in heavy bottom sauce pan. Bring to a low low boil. Reduce heat to low, cover and simmer for 15 minutes. Remove from heat and add dash of salt and 1 teaspoon vanilla extract. Transfer to storage container and set aside to cool. Store in refrigerator until ready to use. In a mixing bowl, whisk together the coconut milk and chia seeds. Be sure to whisk well and watch for clumps of seeds. Stir in sweetener. Place 1/4 cup of strawberry rhubarb sauce in bottom of parfait dish. Top with 1/3 cup coconut chia mixture. Cover parfait with wrap and store in refrigerator up to 12 hours. Carbs: 9g, Net Carbs: 1g, Fat: 5g, Fiber: 8g. I love rhubarb for desserts. Glad to see you can use it in healthier recipes! Well much as I am sure it wasn’t great to feel the effects of slipping on your diet, at least it reminded you how well it had been working for you. This looks great, I love that bright layer of fruit at the bottom. The flavor combination can’t be beat. Glad you found that recipe to make it your own. Oh interesting I didn’t know you could eat strawberries while doing keto! looks delicious! great job! Hi Camila, the berry group is keto friendly 🙂 so all fruit is not out! Wow! Thanks for introducing me to a new keto food…I never realized that rhubarb was low-carb. Chia pudding is my favorite too. Hi Anna! Rhubarb is not high in sugar 🙂 It is high in fiber, protein, vitamin C, vitamin K, B complex vitamins, calcium, potassium, manganese, and magnesium! So a great addition to your diet! Thanks for this recipe, Shelby! I’m super excited to try it!! 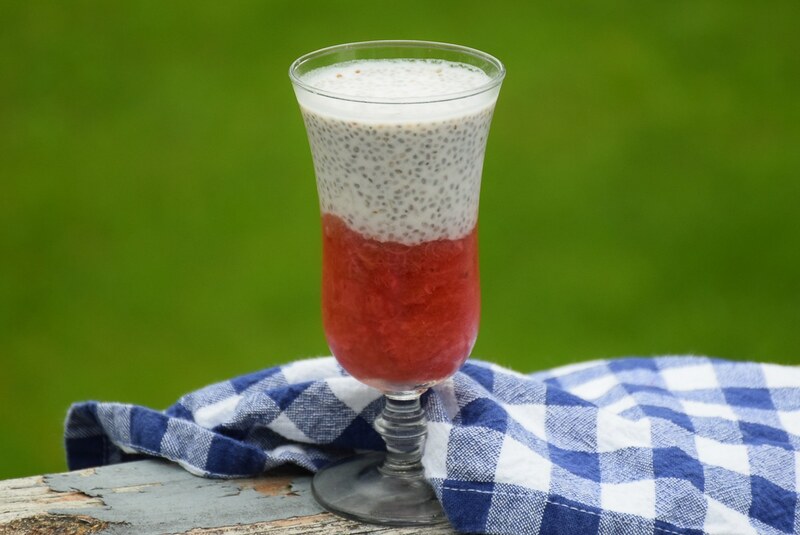 Chia puddings are the best! They’ve got great health benefits too!